Curatorial problems? 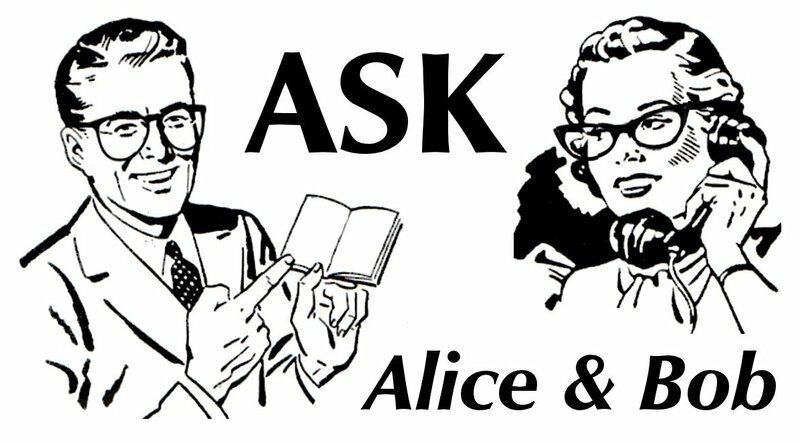 Need advice on venues, installation, artist-relations, or press releases?Ask Alice & Bob for free, independent opinion and problem-solving for contemporary curatorial practice. Online: Enter a question in the “Leave a reply” box below. All questions and responses will be published online and possibly also in print. If you require anonymity please state so in your correspondence. Opinions provided are not necessarily expert advice and Alice & Bob do not accept any liability for actions taken on their advice. Q1: I make neon sculptures of love song lyrics and am concerned about copyright issues involved, especially now I’m selling the work. Do you have any advice? A1: You have 2 main issues to consider here. Firstly how much of the lyrics you have appropriated and whether this constitutes as unique and substantial amount in the eyes of the law. You can’t copyright words but you can copyright lyrics so the legal argument would be whether you have used enough of the same words in the same order to constitute copyright infringement. Your second set of considerations would be who owns the lyric copyright, what kind of copyright they hold including jurisdiction area/country and whether they would be inclined to pursue legal action for copyright infringement. In the UK, authors or copyright holders of literary works (including lyrics) are automatically protected under copyright law for up to 70 years. Whether the copyright holder would be inclined to sue is your main concern. As you are now in a situation of potentially making money from the work in question, this increases the charge of copyright infringement and likelihood of being sued. 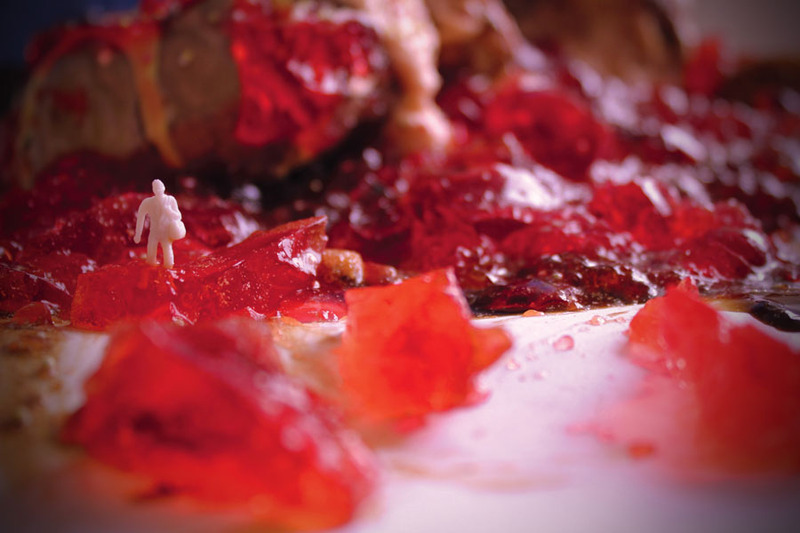 Does the copyright holder have a track record of suing for copyright infringement? Might they be interested in this type of appropriation and open to discussing this as collaboration? Have you made money from their work and do you have money or assets that can be seized to repay for copyright infringement? Authors of literary works can also stipulate under Creative Commons in more detail what sharing, remixing and reusing of their work they permit. If the lyric copyright owner has a Creative Commons license this will give you clear indication of whether they are permitting usage and derivative works and under what conditions eg commercial or non-commercial. You should also get professional legal advice. And a paper bag. Wear it all the time. Please. Q2: I’ll be showing photos at a group exhibition in a white-painted gallery space this year. I think they work best printed big on matt paper, where they take on a deep, dark, luxurious effect. I also feel lightboxes or shiny paper bring them too close to advertising. My tutors definitely think less is more whereas my instinct is to stack em high – in terms of numbers I could use two or three, or up to 10. How would you install these? A2: Odd numbers work, even doesn’t. Less is more in the sense of being selective/editing. I’d go for three or five. Large matt sounds ideal. Never mount on sugar paper unless you’re being ironic. Q3: I am attempting to become the most powerful man in the world, is being a curator the correct way to go about this? A3: If you have ever loved or been loved, then you already know about power; the power of love, a force from above. You need nothing else. If you are not currently in love or loved, there are various internet dating sites available. You can be a powerful man for that right man and/or woman of your dreams and remember; one and one makes two. No one will love you if you are a curator, least of all artists, the public and funding bodies. Furthermore, rid yourself of this need for power. Get a shed, potter. Purge the soul; make love your goal. Q4: How do I get back into art in a big way when a) I lack materials and b) I’ve blown all my savings? A4: Use free/found materials, equipment and the internet. Performance and intervention can be super cheap. Documentation is key; if you don’t have the means to record/photograph/film your work and put it online, find someone who can do it for you. Join/form a collective and pool resources. Be a self-publicist and blog/tweet about it. Materials are everywhere! Free! Behind every high street takeaway there is a cardboard bin, dive in. For drawing media, borrow items from leading supermarkets! Most have some kind of pen handy and whilst we cannot condone theft of any kind, it happens and the big shops factor it into their accounting and still make zillions of pounds of profit! You must have some money….go to the poundshop or Home Bargains. I was there this morning; a 500ml tube of acrylic for only 99p! Or you might simply want to sculpt and manipulate found material, this is totally free of charge. Drawing in dirt, detritus, urine and sachets of sauce pilfered from Wetherspoons; all valid options. If all else fails, sign up for a local college art class or foundation studies course. They have materials. Either stay on the course and make use of a steady supply or take a van load home on your second day. The main advice is to create a buzz. We can all create something, somehow but it takes a special talent or need for attention to ‘get it out there’. Dress like a bum. Make aggressive gestures at passing strangers. Be as anti-social and morally corrupt as possible and then, when all eyes are fixed in your direction, blame your muse. You are an artist. You feel the pain. And people ought to understand this. Get them talking about you. I am proposing to make two long walks through Lancashire and West Yorkshire, stopping off where I have contacts who are willing to organise some sort of event for me (see below). I will travel on foot throughout, camping along the way and occasionally staying in people’s houses or camping on their lawns. The first walk will be from west to east (roughly) and probably happen in early June; the second will be from east to west, retracing my steps as nearly as possible, in September or (possibly) October. The route will cover around a hundred miles, which may take eight or nine days to walk, plus stops, in the spring as there will be more to carry. The walk would be quicker in the autumn. For each stop, I will be asking people to help me organise and promote either a performance, a soundwalk or a qigong/listening workshop (or a performance plus one of the other options) for me. I will provide the publicity material but I am asking people to do a little work to help me get an audience for each event by tapping into their networks, enthusing people and publicising things round about where they live. Can you suggest anyone it might be worth contacting about this? Places it would be good to know about would include Longridge, Whalley/Ribchester, Long Preston maybe, and any Halifax and Huddersfield contacts would be great. For Long Preston way there’s the Grassington Festival in June and they may well have contacts in the area they could put you in touch with http://www.grassington-festival.org.uk/art-and-about.cfm and also Ilkley Literature Festival might be able to signpost to places too http://www.ilkleyliteraturefestival.org.uk/ That’s in September/October. Maybe the HE institutions could be useful links? Q6: I was just wondering if you knew of anywhere in Leeds that accepts unsolicited proposals. It’s just i have to come up with a hypothetical idea for a show for a curation module I’m taking at uni and am completely lost for spaces. I know the Light accepts unsolicited proposals as I’m currently doing a show there myself but all the spaces are far to large for this hypothetical proposal. Any help or input would be greatly appreciated. Q7: I am a film maker that made the Audrey film that was in the Holmfirth Arts Festival last year, and last saw you when I left you drinking at the pub after the artists talk at Back Lane art space. I think I asked you at the time, but never wrote any of your suggestions down.. Would you be able to email a few suggestions of artists networks that it would be handy to be part of? You mentioned few websites and free email lists and a couple of sites that you have to pay for… It would be good to be in the loop about calls for submissions and art exhibitions happening up north. I’m based in Huddersfield. With reference to Q1 and your response to Q3. You are clearly contravening the copyright of my client Holly Johnson, fortunately he is in Hollywood with his friend Frankie so I don’t think there are likely to be any further repercussions. Although the Hooded Claw does get very snippy about such things. Hi Alice & Bob, Im a curator living in Cardiff, and Im putting a show on in Bath next year, however its not funded at all, and I was wondering if you knew some of the best places to ask (before I start begging everyone) for a little petrol money for myself and the artists? Hi Bob, I’d recommend getting in touch with Fringe Arts Bath http://www.fringeartsbath.co.uk/ – they will have great local knowledge. They also have a call for participation for their 2013 festival that might be of interest.